I decided to transform this You Tube Tag into a Blog tag and to present to you my Top 5 Highlighters. Highlighters are a makeup item that are not used by most women, but that can definitely brighten up a dull face. You do not have to apply it everyday, but on a night out, it reflects the perfect amount of light of your face and appears beautifully on pictures. For all you that do not know where to apply your highlighter, this one is for you, because it is very easy to become a Disco ball if the highlighter is not applied correctly. 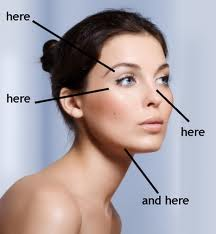 Here is a small image to show you the perfect place of your face to apply highlighter to get that J.Lo Glow ! But note to self : DO NOT GO OVERBOARD ! To pursue in the same direction, I wanna share with you my TOP 5 Highlighters of choice. If I had to recommend one highlighter that every girl should have in her makeup kit to brighten up any makeup look, it would be the Dior Amber Diamond ! I have been using highlighter consistently for about 3 years now and it is my favorite product. I use an oil free liquid illuminator from Lancome that I mix with my moisturizer! The Dior products look really pretty though! The Amber Diamond you must try, it creates such a nice light on your cheeks, I love. I def need to check out some Lancome. <3 Brand new follower over here yay! The Amber Diamond is a must ! This is such a useful post and all of your products are amazing you lucky girl :D. I've got a $100 Asos Giveaway going on. It would be great if you would join :D.
Thx girl, I will for sure check your blog !